Since yesterday was Bastille Day I decided to celebrate by making this all time favorite French dish. 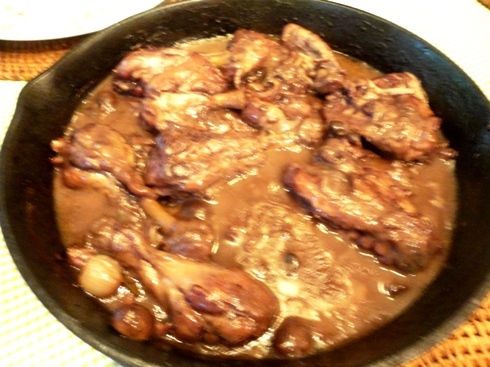 The recipe is fairly easy and cook time is just about an hour. There's lots of flavor from the wine, brandy and herbs which are used to create this dish. 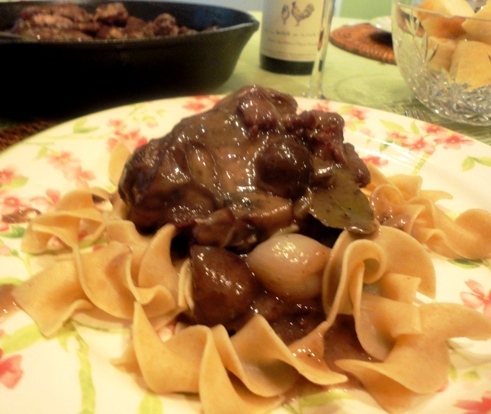 And of course the little flambe action adds excitement to the whole process of making Co Au Vin. In a flame proof pan, brown chicken pieces in 3 T of butter an 3 T of the olive oil for about 10-15 minutes. Remove from heat and add the bacon, pearl onions, mushrooms and garlic to the pan. **Pour the brandy over top and ignite immediately with a long match or torch. Let the flames diminish before adding the wine, broth and bouquet garni, salt and pepper and return to stove top. 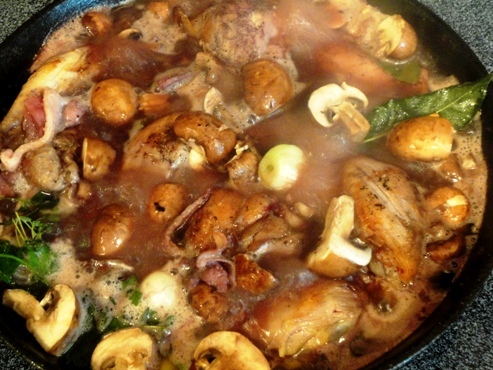 Heat to a soft boil and then reduce heat and let simmer for 45-50 minutes or until the chicken has become tender. Meanwhile in a small bowl add the other 3 T of butter and the flour, mash together and set aside. When the chicken is done cooking remove from the pan and add the flour butter mixture in a little at a time stirring continually...this will thicken the sauce. Bring back to a boil and return the chicken to the pan. Serve immediately and garnish with bay leaves. You can serve it oby itself or over noodles or rice. *Bouquet Garni...typically I will tie fresh thyme and parsley together and add a bay leaf or two to the pan. **Flambeing is believed to add a richness to the food by chemically changing the food's composition. Don't use anything more that 80 proof or 40% alcohol for this process.